‘A Catholic Replies to Professor Dawkins’. I will post a longer ‘review’ in the resources section shortly. Fr. Crean has published at least four books, available on Amazon including a specific refutation of ‘The God Delusion’ (God is No Delusion: A Refutation of Richard Dawkins). ‘A Catholic Replies to Professor Dawkins’ shouldn’t be seen as a book aimed at atheists. If anything, its style is one of conversation with a fellow Catholic. Like a truly good writer, Fr. Crean conveys complex arguments in a very readable way, with a dash of tongue-in-cheek humour woven into the very sound, sensible reproaches. The book focusses on two main philosophies; one held by the author, the order by Dawkins. That it manages to surmise Dawkins’ book, dispensing with unhelpful commentary, and getting down to the main points, is another quality of the book – keeping it succinct and readable. Many people still associate study of the works of St Thomas Aquinas (1225-74) with the dark and dusty atmosphere of an old theological library. In attempt to introduce the study of the Angelic Doctor (so named, some say, because of his extensive writings on angels) a group of Dominican scholastics and lay theological scholars came together some years ago and organized a one week course on Aquinas in Ireland during the summer months. They set up the Aquinas Institute of Ireland, and their first summer school was held in 2014 at a Dominican facility overlooking the sea on the south coast. Some of the organizers teach at the International Theological Institute (ITI) near Vienna, and present and former students of that Institute also attend these summer schools. The stated goal of this Aquinas Institute is “to introduce the thought of St. Thomas to a wider audience, and to lead students of both theology and philosophy towards a deeper and more comprehensive appreciation of his texts.” During the past four years, men, women, lay and ordained, and families too (activities and sports are organized for those who bring their children along), people of many ages and nationalities, have attended these schools. During the week all the participants read closely an extract of Aquinas writings in a prayerful environment, with discussion and reflection on the texts. Since the school also welcomes people who are not familiar with the writings of Aquinas, classes are organized in a manner which helps all grow in appreciation of the depth and wonder of his teaching, and its relevance for our faith today. The Summa Theologica and the Summa Contra Gentiles are the best known of the writings of St Thomas Aquinas. These works are spread over many volumes, but toward the end of his life St Thomas produced a Compendium of Theology, a book of just over 400 pages, which contains a synopsis of the Summa Theologica. Some years ago, Fr Paul Kimball SSPX published his own translation of the Commentary on the Gospel of Saint Matthew. A book of 1026 pages, this work provides many insights into the personal faith of Saint Thomas. Then there is the four volume Catena Aurea, published by Baronius Press. This is a “golden chain” of commentaries by the Church Fathers on the four gospels, translated into English by Blessed John Henry Newman in 1841. St Thomas compiled the commentaries from the Fathers in a manner that allows them to be read as a single exposition of the meaning of each gospel. Finally, for those who want a simple work of St Thomas on fundamental aspects of our faith, The Aquinas Catechism, contains his short and clear explanations of the meaning of the Lord’s Prayer, the Hail Mary, the Apostles’ Creed, and the Ten Commandments. 25th March – Annunciation and talk! 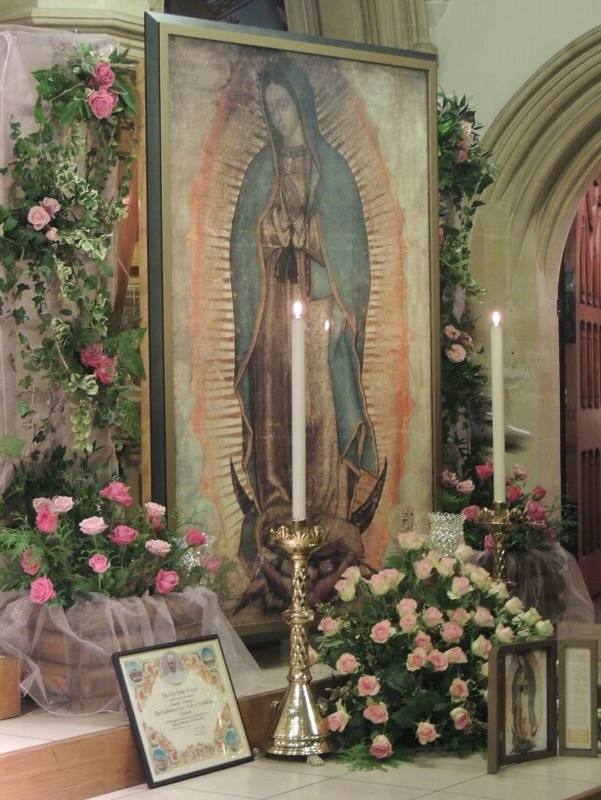 The Miraculous Relic Image of Our Lady of Guadalupe will be visiting Christ the King on Saturday 25 March, the Feast of the Annunciation. The Image is an authorised copy of the original in Mexico City, has the status of a First Class Relic and confers the same graces and blessings. In 2016 the Image travelled more than 3000 miles around the United Kingdom on Pilgrimage Visits and was venerated by more than 25,000 people. The Image has been present at Masses celebrated in many languages, but never, until now, has it been present at a Latin Mass. Fr Gabriel Diaz will celebrate Mass at 10.00, after which the Image will be available for veneration until 11.45, when Barbara Kay, one of the Guardians of the Shrine of Our Lady of Our Lady of Guadalupe in Bedford, will give an explanation of the Image. At 12.00 the Angelus and the Chaplet of Our Lady of Guadalupe will be said and after this, the Image will again be available for veneration until 1.00. There will be a small selection of devotional items related to our Lady of Guadalupe on sale. 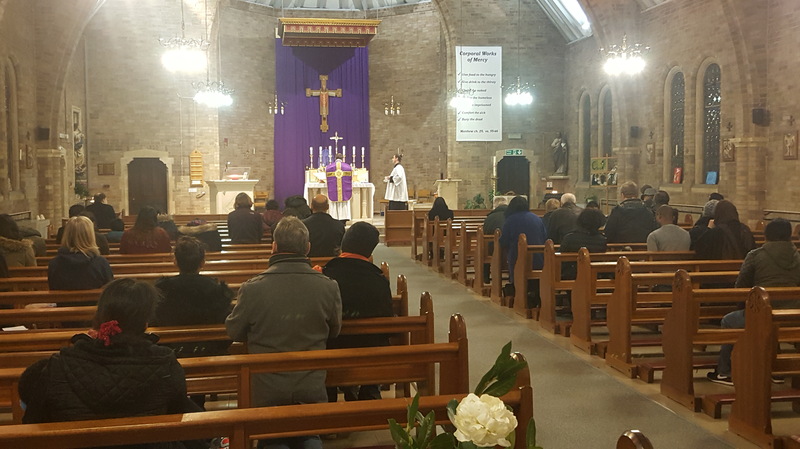 On a wet and windy evening in Bedford, Fr Gabriel Diaz celebrated the first Traditional Ash Wednesday Mass at Christ the King since 1969. As well as many of the usual Sunday morning Latin Mass congregation, we were joined by many other parishioners from Christ the King, including some of this year’s Confirmation candidates, and so we numbered around 100 people. For some of them, this was likely their first experience of the Latin Mass. Fr Diaz has a sonorous voice, and the words “Memento, homo, quia pulvia es, et in pulverem reverteris … ” rang out loud and clear, over and over again, solemnly and unmistakably reminding us of our mortality, as each of the congregation went forward to receive the consecrated ashes on their forehead. There was an awesome silence as we listened to the words of the prophet Joel, reminding us of our sin, but also of God’s mercy towards us if we repent. 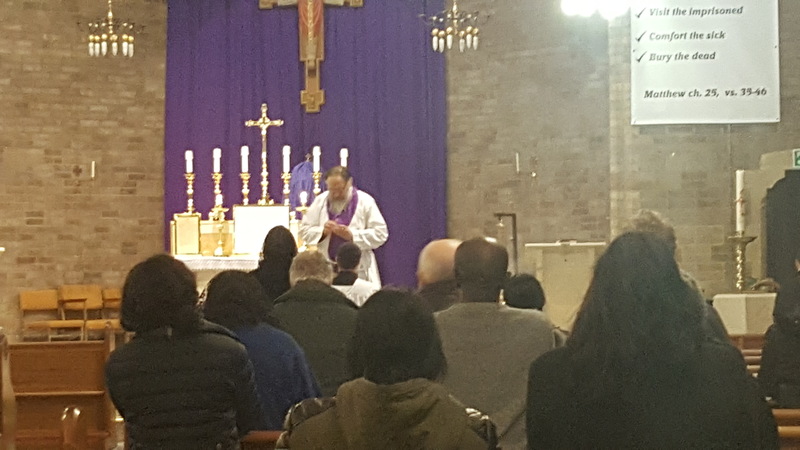 Fr Diaz paused before giving Holy Communion to explain to those not familiar with the method of reception, that at the Latin Mass, this is always received kneeling and on the tongue. 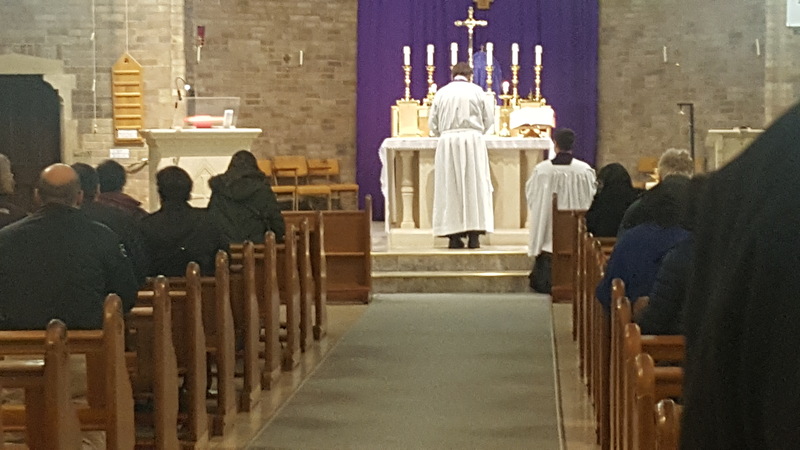 There was something special about this Mass which made it a memorable start to the season of Lent, and I hope some of the congregation for whom the Latin Mass is unfamiliar will come back and learn to love it more. “Remember, man, that you are dust, and unto dust you shall return.” Eek!